In an independence referendum that drew record numbers to the polls Nov. 4, voters in the South Pacific archipelago of New Caledonia voted 56 to 44 percent to remain a French territory. The referendum marked a major milestone in an independence movement that has spanned decades. Political leaders initially agreed in 1988 to hold a vote on independence after a 10-year period of economic and social development. Subsequent negotiations extended the deadline to the end of the 2014-2018 session of the New Caledonian Congress. The final details were settled this past spring when legislators adopted eight criteria to determine who would be eligible to participate in the referendum. Pirates or protesters in Somalia sea stand-off? The March 13 seizure of an oil tanker en route from Djibouti to Mogadishu—the first such incident since 2012—enflamed global fears of a resurgence of piracy off the coast of Somalia. But the tanker and its Sri Lankan crew were released without ransom or any other conditions March 16—hours after brief a gun battle between the captors and the marine force of Somalia's autonomous region of Puntland, followed by intensive negotiations brokered by local clan elders. International media reports referred to the captors as "pirates," whereas local media in Somalia called them "fishermen." In an interview with Puntland's Radio Garowe via phone to the fishing village of Alula, one hijacker said: "We are fishermen in Alula town, our livelihood destroyed by the illegal trawlers and chemical waste dumping. We were fishing and then we saw the vessel spilling waste in the sea, which reached our coast... We are not pirates as reported by the media. We are protecting our territorial waters from the international ships dumping the toxic and chemical wastes on our coast." Somalia: Shabab leader dead in US drone strike? US forces carried out air-strikes against Shabab leader Ahmed Abdi Godane, with casualties reported but uncertainty over the fate of the main target, Somali officials said Sept. 2. Godane was traveling in one of two vehicles hit in apparent drone strike, a member of the Islamist group said. The spokesman would not say whether Godane was among the six militants killed. The two vehicles were heading toward the coastal town of Barawe, Shabaab's main base, when they were hit. The Pentagon confirmed the US military carried out an "operation," and that it was "assessing the results." The US has a large drone base at Camp Lemonnier in Djibouti, and also flies surveillance drones over Somalia from a base in Ethi­o­pia. The Pentagon quietly deployed a small team of advisers to Somalia last October to coordinate operations with African troops fighting to wrest control of the country from Shabab. At least 163 were reported dead March 28 in clashes at Okello, in Pibor county of South Sudan's Jonglei state, pitting government troops against a rebel force whose commander David Yau Yau is said to be among the slain. (See map.) South Sudan accuses Khartoum of supporting the rebels, with military spokesman Col. Philip Aguer saying a seized airstrip was used for arms drops. He suggested Sudan is arming the rebellion in a bid to block the South's plans to build an oil pipeline through Ethiopia to a port in Djibouti. 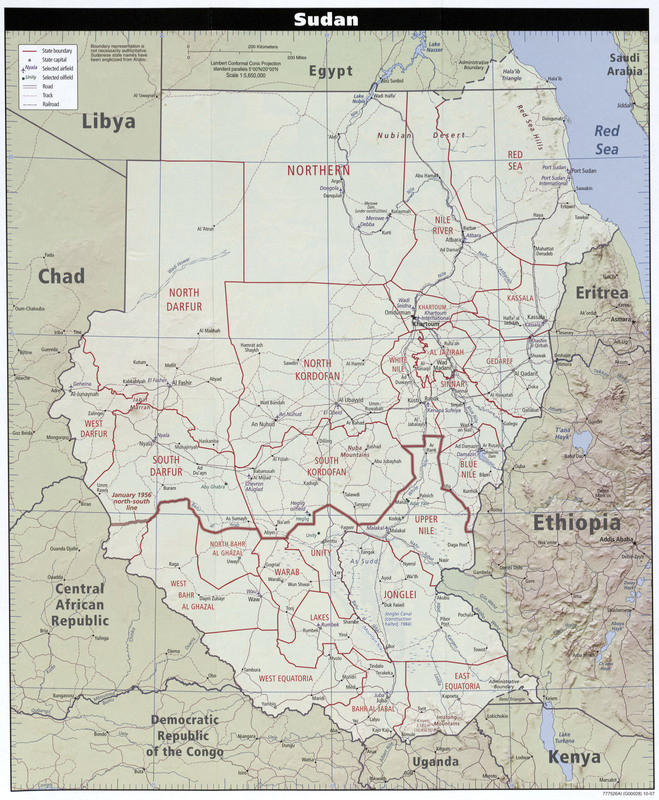 Aguer said the South's military, the SPLA, would continue to "deal with the militia group." (The Guardian, March 28) A Kenyan route for the pipeline has also been broached, with the aim of freeing the South from having to export oil through Khartoum's territory.